Colorful illustration filled One Pager for Argentinian Visual/UI Designer, Kaiser Sosa. The illustrations come to life as you land on each section correlating to the copy to the right. The site is best viewed on medium sized screens. I'm Alberto Sosa aka Kaiser, a Freelance Visual/UI Designer from Buenos Aires, Argentina. I have more than 2 decades in Advertising and Interactive, working with brands from A to Z. I’m currently working successfully at my home-office for regular clients from the States. And with really competitive rates for them thanks to the Argentinean peso-US Dollar exchange. 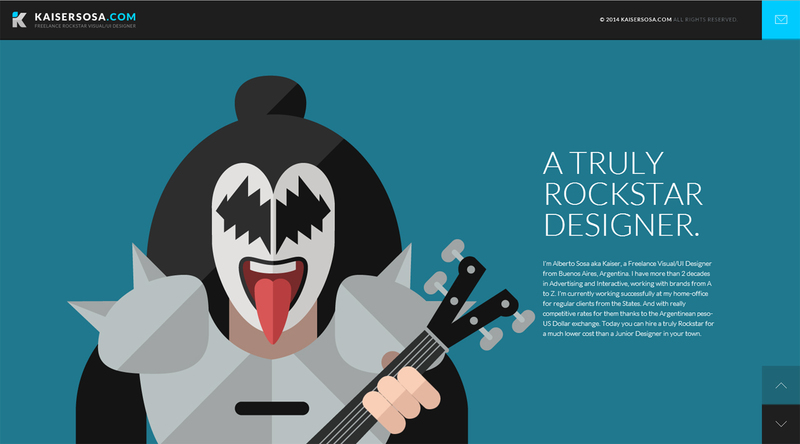 Today you can hire a truly Rockstar for a much lower cost than a Junior Designer in your town.